No monthly premiums. No hidden fees. No insurance headaches. Introducing an exciting way to offer dental benefits to your employees without the expense or hassle of insurance companies. Quality Dental Plan (QDP) saves your business thousands of dollars while providing quality, dental care to your employees and their families. With traditional insurance, employees deal with complicated claims forms, monthly premiums, limited treatments, deductibles and annual maximums. But QDP makes it simple. You can cover their full preventive care for the entire year – and provide significant discounts on all further treatment (including cosmetic work and major procedures). QDP is available immediately to all employees – even part-time or new hires – and their families. Best of all, there are no third-party companies, waiting periods or confusing restrictions. Since each Quality Dental Plan-affiliated office administers their own savings plan, patient support and plan administration is handled by a member of your community, not a 3rd party corporation. 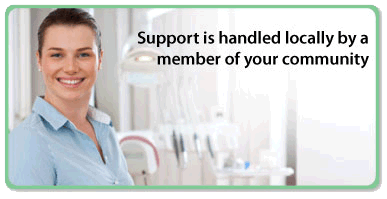 Your Quality Dental Plan office becomes your partner in providing health care for your employees. Quality Dental Plan is your local, affordable option for providing your employees with dental benefits they will value for years to come. Click the Find a QDP Dentist link at the top of this page. Enter your city or zipcode to locate a Quality Dental Plan dentist near you, and contact them to find out more about enrolling your business today. No tiresome paperwork hassles – QDP members enjoy fast, prompt service from their local dental office. Call a QDP dental practice today to find out how you can start offering your employees high quality, low cost dental benefits with huge savings for your business.